Spending on online advertising is slowly going to overtake traditional mediums like radio, TV and print. 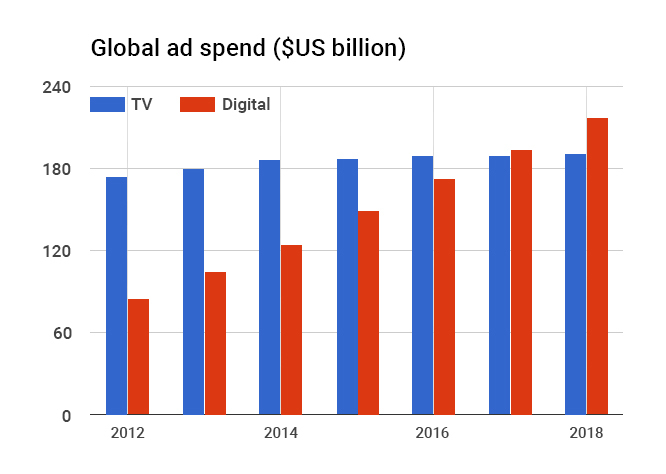 As per a recent Zenith Media report, by as early as 2018, digital ad spend will overtake TV globally. With such fantastic growth in online advertising spends, marketing functions across the board are tuning into the benefits of digital. With the rise of mobile Internet and the increasing importance of mobile phones in our lives, digital is only going to go north from here. Another advantage with digital is that it provides marketers a more accurate medium for targeting and engaging consumers on a very personal level, which is not really possible in traditional mediums like TV, radio or print. All the big Internet companies are thriving because of their ad revenues. Facebook wouldn’t have grown to become the biggest social network in the world without its advertising platform. Google, who mastered the art of online advertising, earns most of its revenues from advertising. And thanks to Google’s publisher program, AdSense, millions of website owners make their living by allowing Google to run contextual ads on their websites. For a marketer, platforms such as Google and Facebook are a godsend, as they allow them to market their product/service to a wide variety of specifically-targeted audiences across the globe. However, it’s important to notice a slow undercurrent in the world of online advertising, where some technologies and platforms are not growing as fast as digital overall. 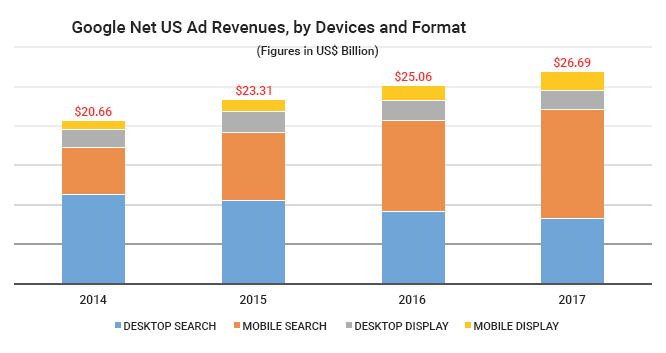 Google’s desktop search revenues are decreasing while revenue from mobile heightens with each passing year. This chasm between desktop and mobile ad revenues led Google to implement the mobilegeddon algorithm update. This update was introduced by Google in April 2015 to give priority to sites that are mobile friendly and rank them higher on mobile searches. Websites that weren’t mobile friendly suffered and lost rankings on mobile searches. Google introduced this update because advertisers weren’t willing to pay to show an ad that takes the user to a website which is not easy to use on mobile and thus led to wasted ad spend. With this update, Google can justify ad spend by brands on mobile ads and assure them a better ROI. SEO is becoming hyper-competitive and mainly works if your content creation capabilities are off the charts. PPC remains very competitive and difficult to crack in low budgets. Banner ads are increasingly becoming annoying and CTR from banner ads is decreasing with each passing day. 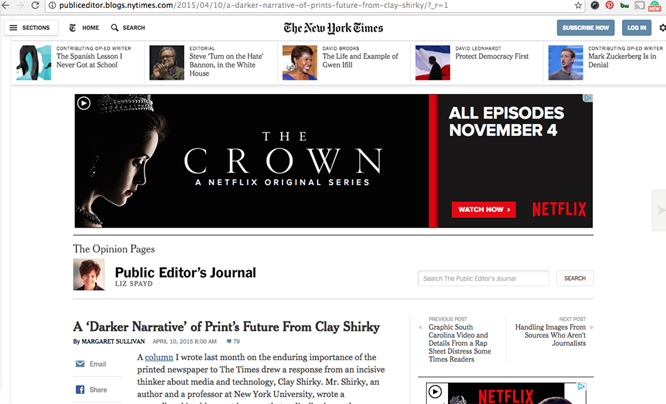 And then there are ad blockers. For the uninitiated, an ad blocker is a small piece of code that runs with the browser, blocking all ads as one traverses through the Internet. These ad blockers have posed a massive problem for the advertisers, accounting for a whopping $22 billion of losses globally! The most famous ad blocker is AdBlock Plus and it has been downloaded more than 500 million times in ten years time since its launch in 2006. This browser extension is available for Chrome, Mozilla, Safari, Android and iOS, catering to a wide range of users. 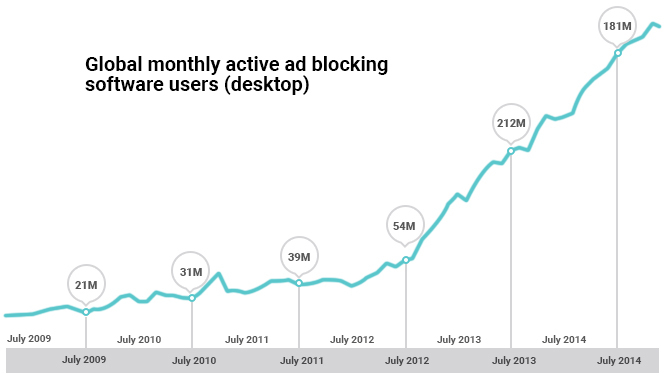 With so many downloads and at least 60 million active users, AdBlock Plus holds an important role in the ad blocking discussion. The main point in this ad blocking discussion is the revenue losses to publishers because of the increasing use of ad blocking software. Since a lot of people are using ad blocking software, a sizeable amount of ads are being blocked and thus never getting served. This leads to a loss to the publisher and to the ad network since no revenue is generated in this scenario. Only the user benefits from this arrangement. However, since most publishers on the Internet offer their content for free and earn revenue only through ads, the use of ad blocking software, in the long run, can be harmful to users. Most of us don’t like to pay for content on the web, but publishers need to earn revenue either from subscriptions or from ads. The intentions of the ad blocking software are noble and they do have the benefit of users as their sole reason for existence. Most people understand that if there are no ads on the Internet, it would be very difficult for all the free content to survive. 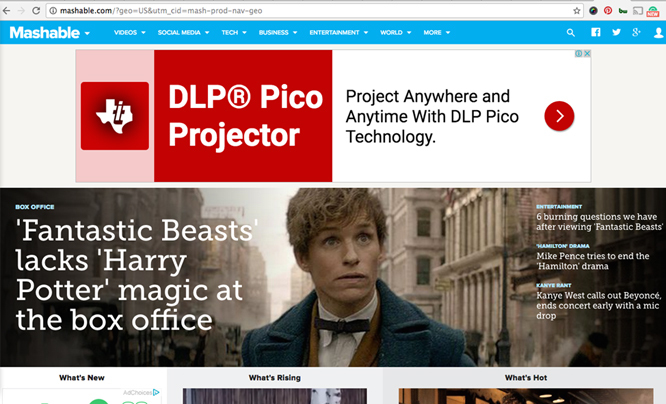 To that effect, AdBlock Plus has introduced a whitelist of ad formats called acceptable ads that can be enabled in the extension to allow some ads to appear while surfing the web. Why Would Anyone Install Ad Blockers? Everything would have remained hunky dory if online ads weren’t such a nuisance and surfing the web was a more user-friendly experience. But all online publishers, large and small, earn revenues by allowing ad networks to publish ads on their websites. The first portion of the page is covered by a huge ad that takes away the focus from the actual content and results in an intrusive — and often frustrating to the point of page abandonment — user experience. The Internet is plastered with ads like these, making money for the publishers and ad networks and increasingly forgetting the end user in this bargain. So, anyone who finds these ads annoying can easily install ad blocking software like Adblock Plus and enjoy a more user-friendly surfing experience. However, this leads to a big dent in advertising revenues, especially of small publishers, and could eventually make them extinct. One thing that definitely needs to happen is that the ads we see online will have to become more intuitive and less intrusive. This responsibility lies with the advertisers, publishers and ad networks to ensure a seamless user experience. Publishers and advertisers can opt for alternatives like native advertising and influencer marketing instead of relying on banner ads. Both of these options provide a user-friendly way of marketing product and services. 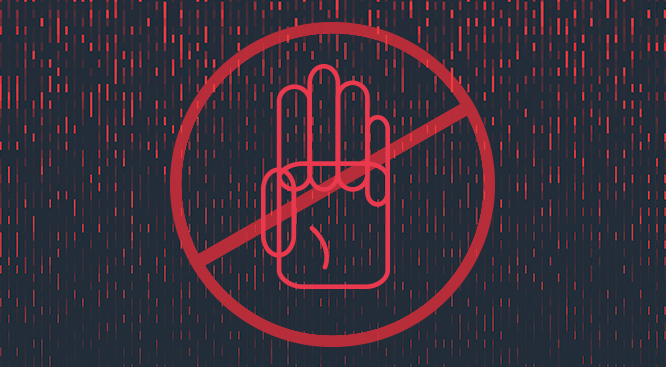 Ad blocking software is a phenomenon born out of the necessity of accessing a clutter-free Internet experience and as the web continues to slow down and demand more bandwidth, hacks like AdBlock Plus are going to flourish and keep questioning the status quo. These hacks work because they empower people to make choices of their own. Different entities will need to work together towards a clutter-free and seamless experience on the web. Who will play a part in what comes next? Publishers, advertisers, ad networks, advertising agencies and, perhaps most important of all, consumers are all going to play a part. Let’s see how each player can help in making the web a more inclusive and user-friendly network. For any network, the biggest strength is its people. And when it comes to Internet consumption, everyone has a voice and a stake. Since the consumer is the king or queen, it is important that consumers lead the way in this transformation. Add your favorite publishers to your filter whitelist for software like AdBlock Plus, so that they can still continue to make a living. Start paying for consuming some content online. This will help the small publisher enhance user experience on their website and keep producing good-quality content. Opt for digital subscriptions of magazines and newspapers. This will be environment-friendly as well. Consumers can also opt for services like Blendle where you can make micropayments to read individual articles from a variety of newspapers and magazines. Most importantly, users need to communicate, participate and give feedback about their experience and be the ultimate filter in the whole process, as this is a fundamental problem for end users and their feedback is most important in finding a solution that works for all. Publishers are gods in their own way for having the opportunity to create the content we consume and define our attitudes and how we perceive the world around us. Be that as it may, that doesn’t allow them to blast users with ads that pop out at us from every nook and cranny of a website and literally ruin the reading experience. Opt for native advertising as a revenue source. Websites like Buzzfeed earns the majority of their revenue from native advertising. With native advertising, websites publish sponsored content for brands in order to earn revenue. This type of advertising is less annoying for the end user and brings in more engagement for the brand. Use new initiatives like the Facebook Instant articles to reach out to more readers and earn additional advertising revenues. 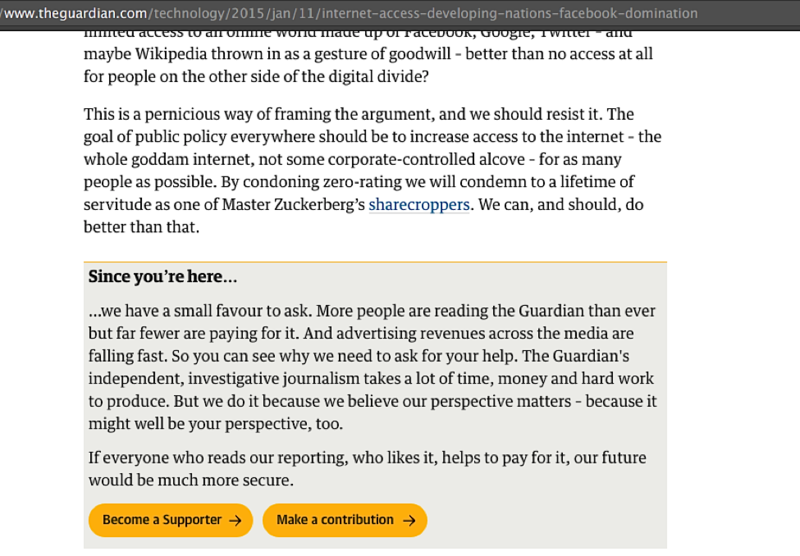 Publishers can also implement paywalls on their websites to make users pay to access content. They can opt for a metered paywall like the NYT wherein users can access a limited amount of free content in a specific time period, after which they have to pay to access content. Publishers can also opt for services like Outbrain which recommends sponsored content to users who are on a publisher’s website and publishers earn revenue from Outbrain based on the number of impressions. Ad networks like Google’s display or search networks need to come up with better ad formats and more inclusive technology. In fact, Google found itself in a peculiar position where its core business is challenged by a browser extension like Adblock Plus. The Google Contributor Program was launched in 2014 and allowed users to access ad-free content in exchange for a small contribution. As of January 17, 2017, however, the Google contributor program has been put on hold and according to their website, a new version will be launched “in early 2017.” Google is also working on developing an acceptable ad policy which will hopefully create an industry standard which everyone can agree on. Creating better ad formats which are less jarring and annoying for the end users. Devising a mechanism to show ads to users in non-intrusive ways and still allow publishers to earn revenue, something akin to what Google tried with the Google Contributor Program. Developing technology that serves the ad faster and uses less bandwidth of the user’s resources. Giving more control to end users (or lose out to new competition like Adblock Plus’s ad network which is in beta right now). Advertisers and agencies will also need to be more open to embrace changes and experiment with new technologies more often. Bombarding the public with ads everywhere all the time is not going to help in the long run and will eventually alienate the very people they are trying to reach. Agencies can work smartly to target ads with more accuracy and make sure the relevance of an ad is mapped to each publisher and user. In the hopes of catching users’ attention, agencies at times go overboard trying to create campaigns that are superficial at best but don’t hold any real-world value for the advertiser or the user. And when agencies do innovate and create great work, advertisers will need to follow through. Create ads which are engaging and relevant to the end users. Use retargeting to reach users for whom your ad might be relevant. Use varied ad formats which are more engaging for the end users. Video ads are a craze for advertisers of all sizes and work well at engaging with viewers. Try new technology and reap benefits of early adoption. So if Facebook comes up with a new ad type, don’t be afraid to be among the first to try it out. Make use of alternative advertising strategies like influencer marketing and native advertising to reach out to users and increase engagement. Online advertising is here to stay, and in fact is only going to become bigger, as Internet penetration increases across the globe. However, while the community figures out ways to deal with ad blockers, marketers can still leverage digital to their advantage. It’s pertinent to work on the right kind of ad types. In 2017, it is best to put more emphasis on targeted banner ads and video ads delivered on digital networks like Youtube, Facebook and Snapchat. Another factor to focus on is the mobile-first approach to target users while they are on their smartphones. Advertising is not as effective as it used to be and as consumer behavior changes rapidly, it’s better to have a measured approach, which relies more on testing, iteration and adaptation. And even though the stakes are high, we think as time passes, online advertising is going to get more intuitive and less intrusive than it is now. This will result in an increase in the usefulness of ads to end users. Until then, take it easy and spend your marketing dollars wisely and keep a lookout for new technology!